18 years before this week’s historic Memorandum of Understanding between the Parliamentary Parties of the Greens and Labour the local Auckland members of these parties and their predecessors got together with non-aligned local community independents to form City Vision to contest the 1998 local government elections in the Auckland Isthmus. 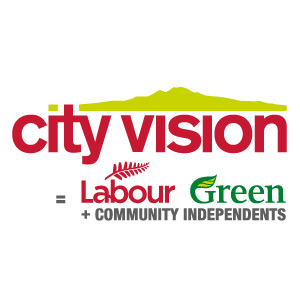 That year and since City Vision has succeeded in electing capable, hard-working and principled people to the Council, Local Boards and the Auckland District Health Board to carry out practical progressive community-oriented policies effectively and consistently. City Vision was formed in 1998 as a political grouping to work to protect and develop our city and communities. We represent the local Labour and Green parties and other progressive people who are active and keen to represent their communities but do not belong to any political party (community independents). City Vision’s values are known and proven. We have always been the team who has stood up for social justice, for public transport, for environmental protection, for public ownership, and for local communities to have a real say. We’ve recently updated our guiding policies and principles.